Herbert McMaster exits as NSA chief following disagreements with President Donald Trump, particularly, the relationship between Trump and Russian President Vladimir Putin. 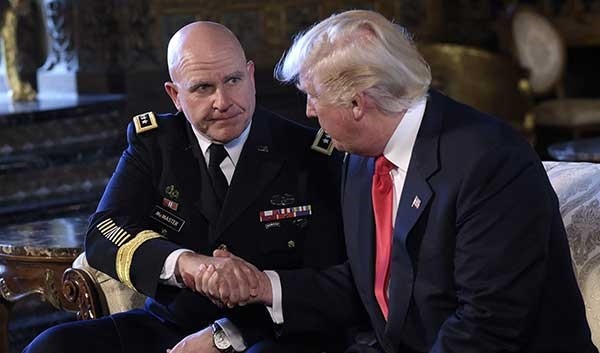 U.S. President Donald Trump has announced the replacement of his National Security Adviser, Gen. Herbert McMaster, with former U.S. Ambassador to the UN, John Bolton. Trump announced on his Twitter handle that McMaster would handover to Bolton on April 9. “I am pleased to announce that, effective 4/9/18, @AmbJohnBolton will be my new National Security Advisor. “I am very thankful for the service of General H.R. McMaster who has done an outstanding job & will always remain my friend. “There will be an official contact handover on 4/9”, Trump announced in a tweet. However, McMaster said in a statement released by the White House that he was leaving the position following his retirement from the U.S. Army. “After 34 years of service to our nation, I am requesting retirement from the U.S. Army effective this summer after which I will leave public service. “Throughout my career it has been my greatest privilege to serve alongside extraordinary service members and dedicated civilians. “I am thankful to President Donald J. Trump for the opportunity to serve him and our nation as national security advisor. “I am grateful for the friendship and support of the members of the National Security Council who worked together to provide the President with the best options to protect and advance our national interests”. McMaster served for about a year following the exit of his predecessor, Michael Flynn, who resigned amid controversy over his contact with Russian officials within a month in the job. Trump’s was rumoured to sack McMaster last week, but White House came out to deny it. McMaster’s exit followed a string of reported disagreements between him and the President, particularly, the relationship between Trump and Russian President Vladimir Putin. Trump reportedly failed to develop good relations with McMaster after complaining that he was “too rigid” and his “briefings go on for too long”.